Youth Protection and How it Works - Click here to see the process of protecting our youth! 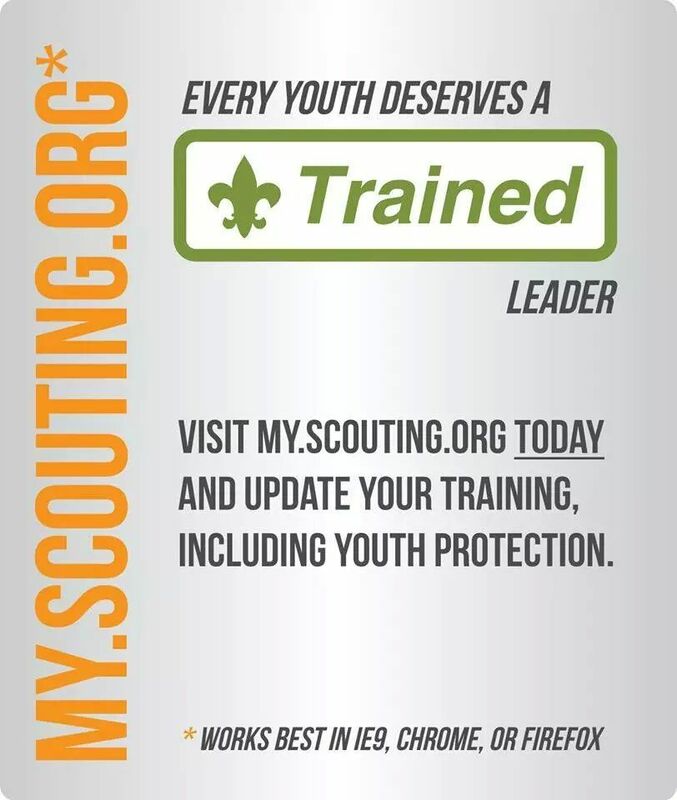 What makes a trained leader NEW UPDATE: "This is Scouting" is no longer a required training. To be fully trained in your position, click here. Any registered adult leader should attend training for the position they have registered to serve in. If an adult leader changes positions while still registered, he or she should attend the Leader Specific Training for the position they currently serve in. ALL REGISTERED ADULT LEADERS MUST COMPLETE YOUTH PROTECTION TRAINING EVERY 2 YEARS. What Courses are Available and Where can I go to get Trained? There are several courses available for training, as well as several supplemental training events such as Pow Wow and University of Scouting. The District Training Chair schedules District trainings for Cub Leader Specific, This is Scouting, Youth Protection, Scoutmaster Specific, etc. But you are not limited to take training in your district. A leader may travel to any district to complete his/her trainings. Please Note: To take an online training, you must have your membership ID number ready. This can be found on your BSA membership ID card. "Every youth deserves a Trained Leader"